This traditionally styled square table is constructed with nine 2" x 10" recycled plastic resinwood slats that compose the table top and bench seats. The earth-friendly slats give the classic look of wood but are splinter-free, will not corrode or rot over time, and have rounded edges and corners to ensure safety. Ideal for family picnics, group lunches, and other social gatherings. The heavy-duty 1-5/8" O.D. steel table base is hot dipped galvanized and powder-coated black for maximum durability. Leave the table portable to allow for relocation or secure it to the ground using the optional U-Brackets to deter theft. 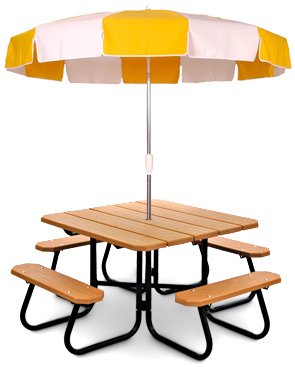 Choose from any of the recycled plastic resinwood color options shown to match this picnic table to any environment. Opt for an 1-1/2" umbrella hole and choose from any of our outdoor umbrellas to complete the look. Comes standard with heavy-duty, zinc coated hardware.